Early in the morning of 3 February 2008, Jason Vassell, then a student at the University of Massachusetts in Amherst, was thrust into every black man’s nightmare. Two drunken bigots approached his dorm room window shouting racist slurs and sexual innuendo about two (white) female friends inside. When Vassell refused to go outside to confront them, they broke through his window. Then, when he left to get help, they entered his dormitory lobby and attacked him, breaking his nose and giving him a concussion. Managing to fend them off with his pocketknife, he fled behind a locked door. Later that day when he went to press charges, Vassell was arrested within one minute of setting foot inside the police station—for the “crime” of defending himself. Outrageously, Vassell faces two felony counts of assault, with a potential sentence of 30 years! Both of the racist thugs who attacked him had extensive criminal records for similar incidents, yet one was sentenced only to probation, while the other wasn’t charged at all. The District Attorney’s continuing persecution of Jason Vassell recalls the infamous 1857 Dred Scott decision in which the Supreme Court held that blacks “had no rights which the white man was bound to respect.” Vassell’s lawyers are pursuing a civil rights case, fighting to get the charges dropped on the basis that he has been selectively prosecuted because of his race. Students and community members have rallied to Vassell’s defense, organizing protests and showing up to his hearings. Drop the charges against Jason Vassell! To add insult to injury, the university sided with the racist police and presented Vassell with an ultimatum: withdraw, or face expulsion. Let Jason Vassell return to his studies! The persecution of Jason Vassell shows that even at supposedly “progressive” campuses in “progressive” states, racist violence, repression and injustice against black people are inherent in capitalist America. Under capitalism, the universities are run to benefit the bosses and reinforce the norms of racist, capitalist society. Abolish the administration! For student/teacher/worker control of the universities! American capitalism was founded on black chattel slavery and black people today constitute an oppressed race-color caste, segregated at the bottom of society. But black people are not just victims of racist capitalism. Black workers are integrated at the point of production and compose a key section of the proletariat. The only way to achieve full equality and integration is through the fight to overturn the entire rotten capitalist edifice. 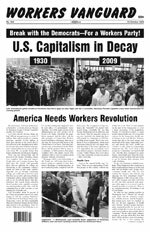 Class-conscious black workers, armed with a revolutionary program, will play a central role in building the workers party necessary to sweep away the capitalist system of exploitation and racial oppression. Send protest letters demanding the dropping of charges against Jason Vassell to: Elizabeth Scheibel, Northwestern District Attorney, One Gleason Plaza, Northampton, MA 01060 and to Martha Coakley, Massachusetts Attorney General, One Ashburton Place, Boston, MA 02108. The Partisan Defense Committee, a class-struggle, non-sectarian legal and social defense organization associated with the Spartacist League, has contributed to Jason Vassell’s legal defense and encourages others to do so. Checks should be made out to his mother, Esmie James, and mailed to Justice for Jason, P.O. Box 197, Amherst, MA 01004.